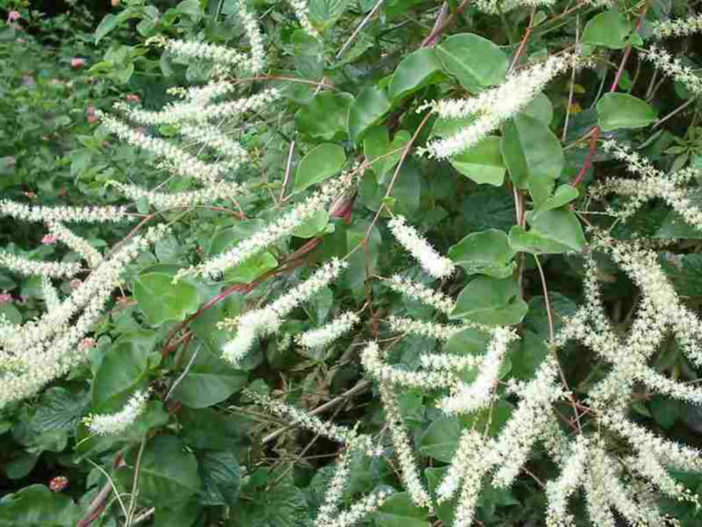 Anredera cordifolia, commonly known as Madeira Vine, is an aggressive, succulent, climbing, perennial vine that can rapidly invade areas in mild, frost-free, subtropical to tropical regions. It is native to relatively dry sub-tropical areas of South America in Bolivia, Paraguay, Uruguay, southern Brazil and northern Argentina, but has over time been cultivated around the world as an ornamental plant. Madeira Vine grows from fleshy rhizomes. It climbs by counterclockwise, twining, reddish-green stems with distinctive, heart-shaped thick and fleshy leaves. The stems grow up to 120 feet (36.5 m) long, 10 to 20 feet (3 to 6 m) per year. More mature vines have weird knobbly growths like small potatoes along its length. Beyond this stage the plant is very quick growing and vigorous, with stem tubers growing rapidly. Once it has taken off like this, pulling the vine down from trees will knock its tubers to the ground where they’ will grow, so care must be taken. Cutting and gently removing small sections at a time, and/or laying a sheet on the ground below to catch the tubers. By now the main underground tuber will have enlarged and will require careful digging to get it all. Be aware that the tubers can lie dormant in the soil for many years.